All transactions are safe and secure with a reliable history in online purchasing behind each of our associates. 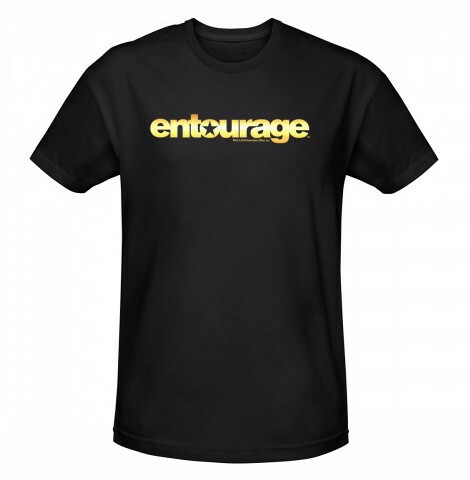 Buy the Entourage Logo t-shirts to own Entourage clothing and merchandise. The front of this tee displays the familiar Entourage TV show logo. The distressed gold logo design will have your friends asking you if Turtle is your driver. The design looks great on this black tee. Whether you know an aspiring actor or a loyal fan of the Entourage TV series, this tee will make the perfect gift. These Entourage t-shirts are 100% cotton and preshrunk for added comfort. Relax in this tee as you listen to the HBO Entourage Soundtrack CD. In addition to the Entourage Logo tees above, browse the Entourage Clothing Gallery for more apparel like men's and women's clothes, kids shirts or hoodies.